When the British Olympic Association asked us if we could make 40 red, white and blue cushions for the young GB athletes taking part in the Youth Olympic Winter Games; Innsbruck 2012 we were delighted to take on the challenge of getting all 40 cushions finished in time. We were successful and were able to get the cushions delivered to BOA in time for the GB athletes to choose their cushions before they left for Innsbruck. They loved them so much that they took them to Innsbruck with them! 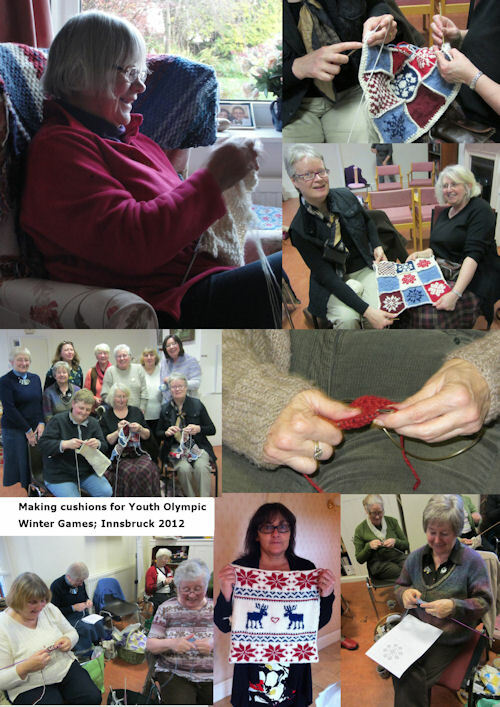 spent so much time knitting them for us". Here are photographs of some of the makers. 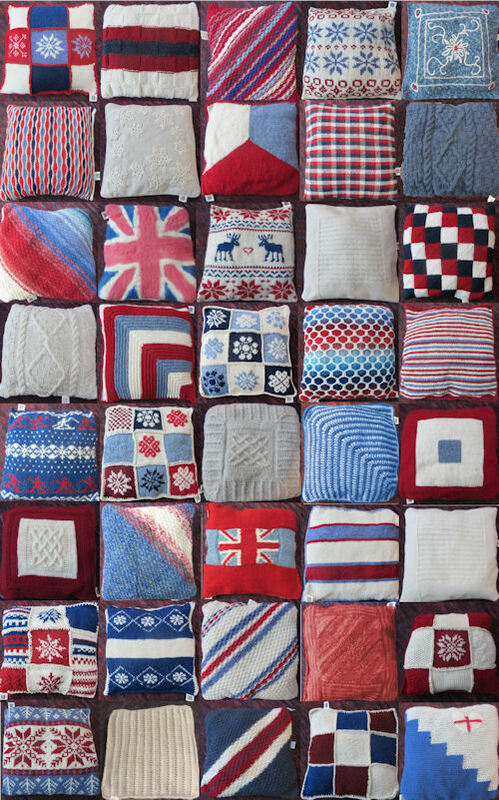 These are the 40 cushions themselves - all made of British wool they have been made by knitting, felting, crocheting and hand-weaving. 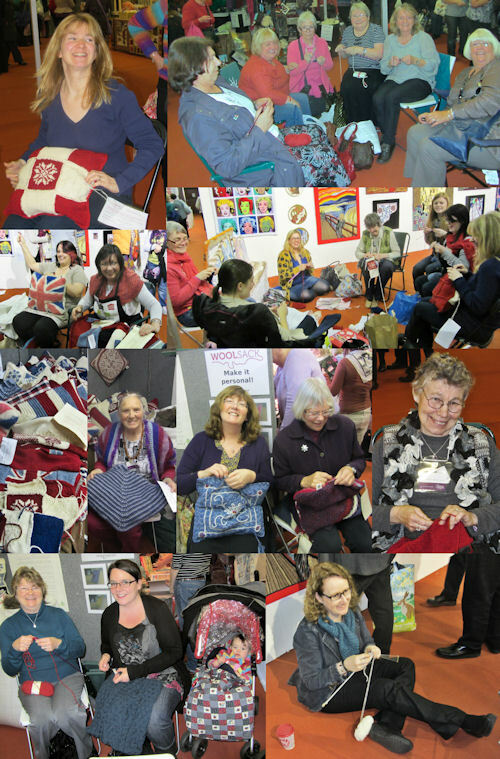 All the cushions had to be stuffed at the Harrogate Knitting and Stitching Show 24-27 November. After most makers had had only 2 to 3 weeks to make their cushions, in a few cases less where hold ups with the mail had delayed their red, white and blue yarn getting to them, success was far from certain. 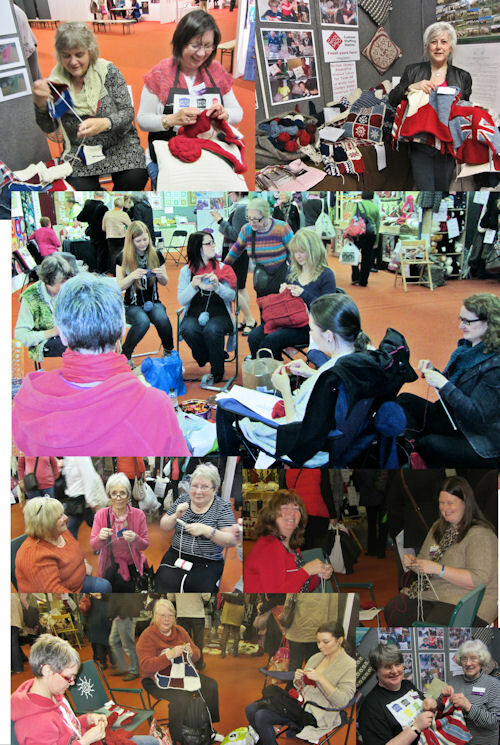 Harrogate turned into a massive team effort with shoppers giving up time to come and knit a square or crochet squares together. As news came that one promised cushion wasn't going to make it, other cushions that hadn't been expected turned up instead. They came from all over the UK. Posted, brought by friends or brought by the makers themselves. 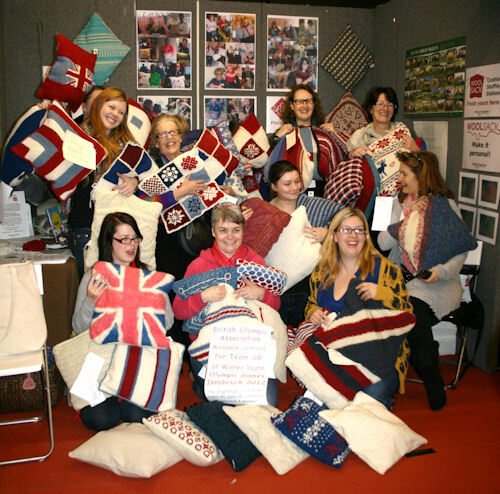 A group of women who had all served in the British army in Singapore during the 1960's gave up an afternoon of their shopping reunion and sat and made an entire cushion between them. By the last day of the show we were just 2 short. Then a cushion turned up out of the blue from a lady whose parents had been very much involved with the start of the Young Farmers and her children were the 3rd generation of Young Farmers. She was rather surprised to receive a very grateful hug. Surely, somehow, we could make that final cushion during the day. My knitting group, from the Knit Studio in Blackfriars, Newcastle came to the rescue, together with Marjorie and Sheila from the Knitting and Crochet Guild. Their day trip down turned into a cushion making team effort and at 4pm we'd finished. The sense of triumph was exhilarating. How much we were hoping that all the young British athletes these cushions were being made for could experience similar success and exhilaration by being part of a team that could exceed their greatest hopes and dreams. 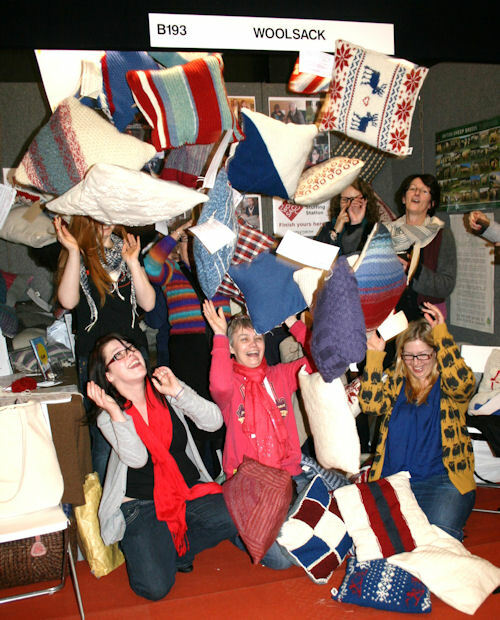 After the formal group shot, excitement took over and the cushions were tested for durability. All passed!